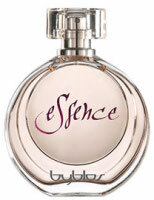 Byblos has launched Byblos Essence, a new perfume for women. The tag line: "be in rapture". The Byblos Essence fragrance is itself an expression of sophisticated simplicity and of embracing sensations. It is a fragrance of contrasts, merging citrus notes to ozone and marine notes and balsamic woody notes. Byblos Essence is a floriental, and was developed by perfumer Christine Nagel. The notes include bergamot, neroli, mandarin, freesia, marine accord, jasmine, geranium, pink aloe, musk, cedar, teak wood and vanilla. I like the bottle and the writing on the bottle but I may never want to sniff. Marine and ozone, hmph. When are we men going to get a Byblos frag? I love the brand, the clothes (I cannot afford them, but I copy many looks from their shows) and I loved the Terra, Mare, etc they did in the 90's. The original Byblos for men is a bit too old fashioned for my taste (as in 80's powerhouse-strong) and I guess is either very hard to get or totally discontinued. I will keep waiting… for now hehehe. I was too quick to shoot, just checked the Byblos page here in NST and there is a “new” byblos man… Will see if I can get it somewhere. Gracious, no need to apologize — I forgot all about the new Byblos men. Sounds Very Pretty! The Bottle is So Gorge! the first women's Byblos fragrance was ASTOUNDING! LOVED IT! the men's also! hope this is a Modern Masterpiece, with the notes that are there it seems like it will be!